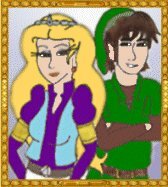 When Kirsty and I first began writing our Zelda series we had no idea it would grow as large as it eventually did. The world we created from Hyrule was rich in places and characters and events and after a while this became hard to keep track of, not just for ourselves but also for our readers. It was inevitable that people wanted to know more about our saga other than just the stories themselves. As a result we created the Almanac - a complete guide to our fanf-fiction series. There is a timeline, guides to all major and minor characters, maps, plans and much more. Be aware that this section DOES contain spoilers so if you haven't yet finished reading the books it might be wise to avoid some of the sections such as the character biographies or the timeline. To read a chapter, simply click on the links below.